Marte will continue to get starts in center field after the Diamondbacks added Adam Jones to the roster, Nick Piecoro of the Arizona Republic reports. Arizona general manager Mike Hazen addressed Jones' addition Monday, telling reporters that the 33-year-old will play quite a bit at all three outfield positions. 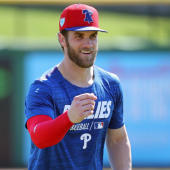 At the same time, Hazen addressed the speculation about Marte's anticipated playing time as the primary center fielder, which he believes has been overstated in the media. "I think 'primary' has always sort of been taken too far," he said. "We've said the whole time he's going to play center field, second base and shortstop, and that's still going to be the case." The Diamondbacks could use a rotation in center field that consists of Marte, Jones and Jarrod Dyson. The bottom line for Marte is that he'll enhance his versatility and positional eligibility in 2019.